With a 5-star safety rating in its kitty, the Tata Nexon has become the first India-made car to achieve this feat. 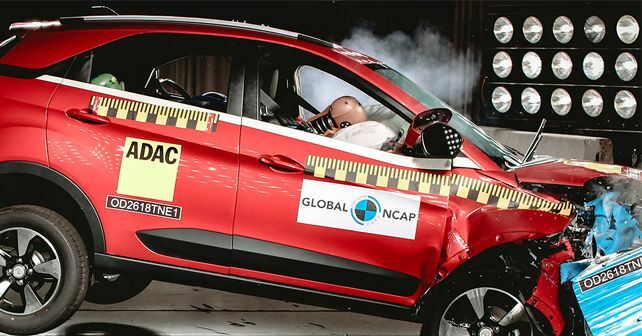 Earlier this year in August, Global NCAP crash tested the Tata Nexon and awarded the compact-SUV a 4-star rating. It was an excellent score as not many India-made cars have achieved this feat. However, it seems that the folks at Tata Motors weren’t satisfied with the final scores. So, back they went to their R&D centre, added a couple more safety features to the SUV, reinforced the vehicle's structure even more, and sent it back to the Global NCAP test bed. And, guess what, their efforts have finally paid off. The Nexon now has a full five-star Global NCAP safety rating! Not to mention, in doing so, the compact-SUV has also become the first India-made car (by any manufacturer) to have a 5-star safety rating to its name. To better its previous score, Tata added seat-belt reminder feature for both driver and front passenger as a standard feature across all variants of the Nexon. Additionally, the vehicle's structure was further beefed-up to meet the stricter UN95 side-impact crash protection requirements. Thanks to these two updates, the Nexon scored 16.06 points out of 17 in Adult Occupant Protection, thereby, scoring full five-stars. The previous score was 13.56 points. The Child Occupant Protection is unchanged at three-stars. With more and more Indian car buyers getting aware of safety ratings of cars, the Nexon’s 5-star score will definitely help boost the vehicle’s sales as well as its popularity among the masses. At the same time, this would also push other home-grown as well as foreign car makers to build safer cars in India. That’s because while passenger safety is the primary objective of these tests, having a product with high safety ratings can inevitably also work as a great marketing tool for car manufacturers.